Pierolapithecus catalaunicus : the last common ancestor of the living great apes? Scientists in Spain have discovered fossils of an ape species from about 13 million years ago that they think may have been the last common ancestor of all living great apes, including humans. The new ape species and its possible place in prehuman evolution are described in today's issue of the journal Science by a research team led by Dr. Salvador Moyà-Solà of the Miquel Crusafont Institute of Paleontology in Barcelona. The fossil remains were found near Barcelona and named Pierolapithecus catalaunicus. In the report, the researchers concluded that the well-preserved skull, teeth and skeletal bones promised "to contribute substantially to our understanding of the origin of extant great apes and humans." Dr. David R. Begun, a paleontologist at the University of Toronto who is familiar with the research but not a member of the team, called the fossils "a great discovery," adding, "I am convinced it is a great ape." About 25 million years ago, Old World monkeys diverged from the primate line that led eventually to apes and humans. About 11 million to 16 million years ago, another branching occurred, when primates known as the great apes - which now include orangutans, chimpanzees, gorillas and humans - split from the lesser apes, represented by today's gibbons and siamangs. Although the great ape group includes humans, Dr. Brooks Hanson, deputy editor for physical sciences at Science, said, "it's important to remember that we've had millions of years of evolution since then." The lineage leading to humans branched off from the chimpanzee line an estimated seven million years ago. The scarcity of fossils from those periods has handicapped scientists searching for evidence of the common ancestors of great apes that emerged after the split between them and the lesser apes. Some candidates for that role have included Kenyapithecus and Afropithecus, but Dr. Moyà-Solà said their fossils appeared to be too primitive to be the common ancestor. Dr. Moyà-Solà's team said the overall pattern of their fossil skeleton suggested that the species was either the last common ancestor of great apes and humans, or close to it. Dr. Begun said some aspects of the specimen's face, palate and teeth made him think that the species was perhaps a little farther down the evolutionary line of great apes than the common ancestor, but was a significant find, nonetheless. The newly discovered individual, probably a male, weighed about 75 pounds and had a stiff lower spine and flexible wrists that would have made it a tree-climbing specialist. The researchers said its arboreal abilities were more similar to those of later great apes than to the more primitive monkeys. The Pierolapithecus rib cage, or thorax, is wider and flatter than a monkey rib cage and similar to that of modern great apes, Dr. Moyà-Solà said. "The thorax is the most important anatomical part of this fossil, because it's the first time that the modern great-apelike thorax has been found in the fossil record," Dr. Moyà-Solà said in a statement by the journal. 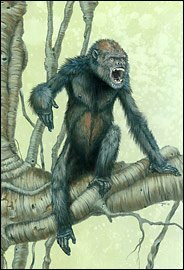 In a conference call from Barcelona on Wednesday, another member of the research team, Dr. Meike Köhler of the Barcelona institute, said the Pierolapithecus probably ate fruit, judging by its teeth, and had a flat face and wide nose somewhat like a chimpanzee's. The age of the fossil species, between 12.5 million and 13 million years, "coincides quite well with ages for the common ancestor proposed by geneticists," Dr. Köhler said. In their report, the researchers noted that the skeleton showed that those early great apes "retained primitive monkeylike characters" and thus did not seem to support "the theoretical model that predicts that all characters shared by extant great apes were present in their last common ancestor." Finding the ancestral ape in Spain, and not Africa, posed no problem for scientists. The Mediterranean Sea expanded and contracted frequently in the past, permitting the dispersal of life between Africa and Europe. The Pierolapithecus, paleontologists said, probably lived on both continents.